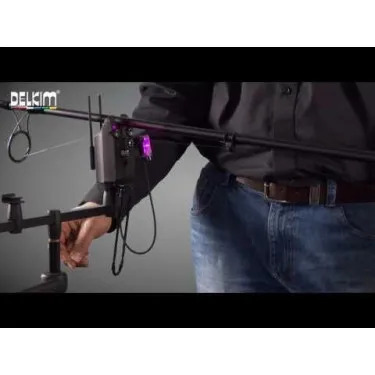 The Delkim NiteLite Pro Illuminating Hanger evolved from the original NiteLite and took three years of intensive development and field testing to perfect. The challenge was to find a way to make a version of the original NiteLite with the advantages of a cable assembly that performed as a lightweight chain. Not as easy as it sounds. After much research, particularly into the medical endoscope field (ouch!! ), nothing suitable was found so we had to invent something new, the CatFlex cable assembly. 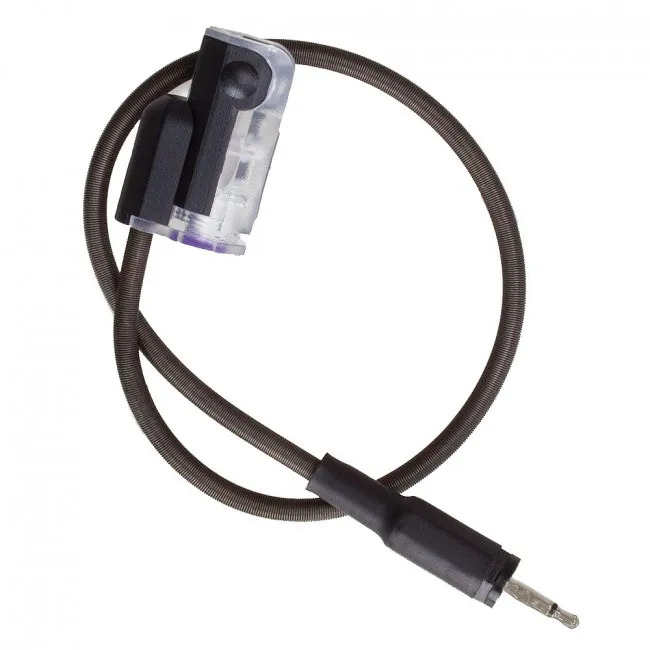 This gives good tensile strength and allows the fine wires needed to connect to the Delkim Plus range bite alarm to be protected and encased in a flexible black stainless steel coil. The complete assembly hangs in a perfect Catenary+ curve. Also included in the development of the NiteLite Pro Illuminating Hanger was a completely new self-adjusting integral magnetic ball clip which makes the old style adjustable types redundant. 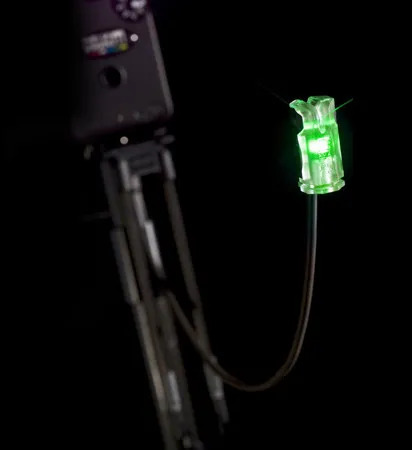 The NiteLite Pro is a complete illuminating hanger, line clip and bite alarm attachment all in one, that performs just like a chain. It replicates all the Delkim Plus range of alarms' LED functions, flashing latching, brightness adjustment and Night Marking WITHOUT ADDITIONAL BATTERIES. It is strong, hangs perfectly, is self-adjusting and non-twist. 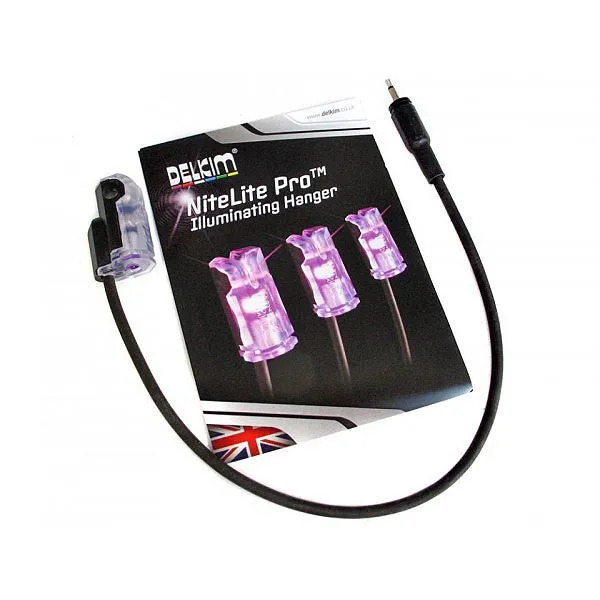 The NiteLite Pro Illuminating Hanger can only be used with the Delkim Plus range of bite alarms and is recommended for use with the corresponding alarm colour. excellent piece of kit !! Package around nite lite was ripped open at the side. Don't look broken so will be keeping it. Its a Christmas present.